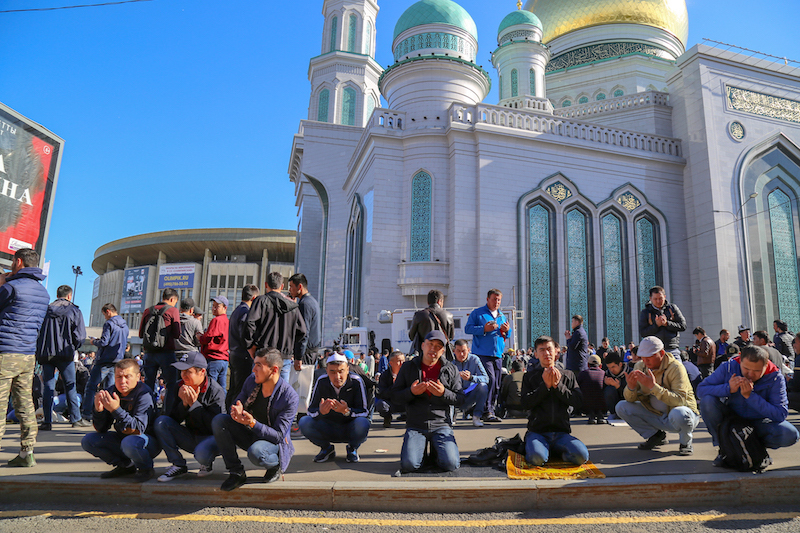 As the sun set on Ramadan and thousands of Muslims gathered to pray in Moscow, the World Cup opened across town. 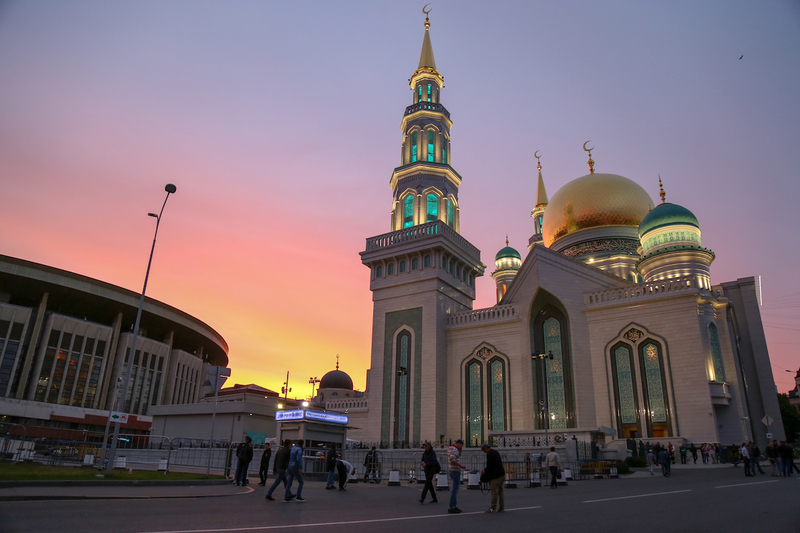 Tens of thousands of Muslims prayed in and around Moscow's main mosque early on June 15 to mark the end of Ramadan, the Islamic month of dawn-to-dusk fasting. Security is always tight at the communal prayers, but this year was unusual: Across town, the World Cup opened only hours earlier. The celebration at the end of the month, known as Eid al-Fitr, is usually marked by family gatherings, presents, and special dishes. With the summer solstice only days away, Russian devotees have another reason to celebrate this year: They have endured some of the longest fasting hours in the world, close to 16 hours per day in Moscow and even longer in cities like St. Petersburg. 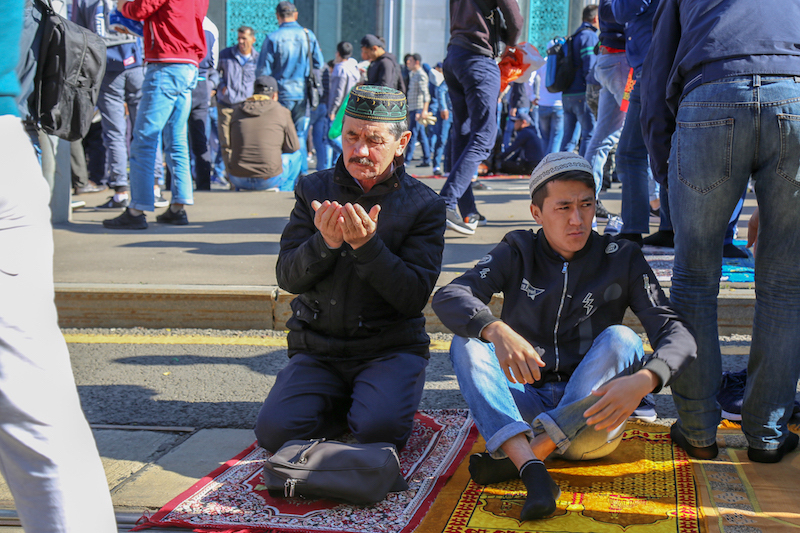 “It’s hard for us because there are few places for us to [pray] in the city and the days are extremely long, which makes fasting even more difficult,” said a young Kazakh man from Shymkent. At the Cathedral Mosque by the Olympic Stadium on Prospekt Mira, Russia’s Grand Mufti Ravil Gainutdin told the assembled crowds spilling into the streets that they numbered 40,000. Indeed, the neighborhood was filled with worshippers. The new four-story Cathedral Mosque (Sobornaya Mechet) opened in 2015 and can accommodate 10,000 worshippers. Gainutdin said Russia’s Muslim community has reached 25 million (or about 17 percent of the total population). Millions are thought to live in Moscow region; many are migrant laborers from former Soviet republics in Central Asia and the Caucasus. But this year, many marking the holiday were visiting for the World Cup. “It’s even more interesting to mark the end of Ramadan with fellow Russian Muslims and people from around the world while I am here for the World Cup,” said a Saudi fan who had traveled to Moscow with his family and gave his name as Sayed. Many Saudis and numerous other nationalities attended prayer services after the inaugural match of the World Cup, which pitted Russia against Saudi Arabia and ended during the last hours of Ramadan with a 5-0 win for the host. Russia uses events like the World Cup to burnish its image internationally and is going to great lengths to let nothing spoil the party. Amir, a 20-year-old from Jalal-Abad, Kyrgyzstan, said he found security much tighter this year than last, especially for Central Asians. 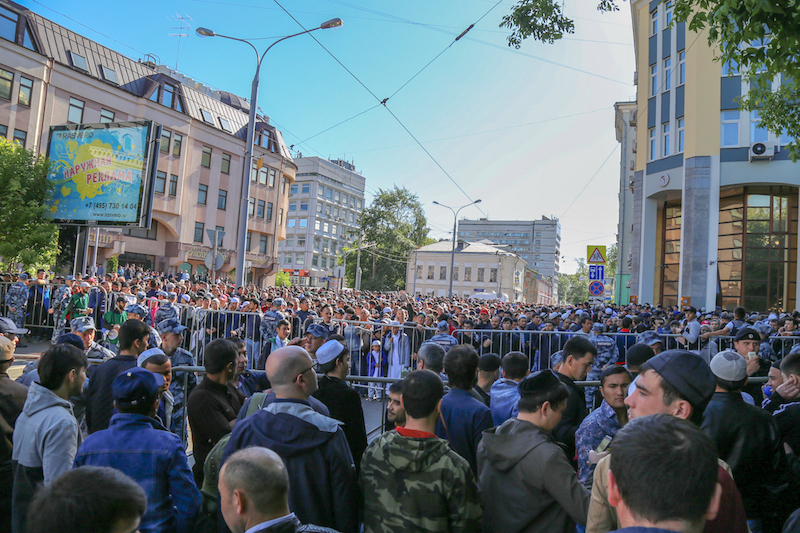 “I have my documents but many of the people who come to the mosque don’t and are nervous about being stopped by the police,” Amir, who arrived at the mosque the night before the prayer to secure a spot inside, told Eurasianet. Until last month, visitors to Russia had to register with the police within seven days of arrival. On May 12, President Vladimir Putin decreed that, for the duration of the World Cup, the period would change to three days, forcing many visitors to scramble for proper papers. Valentina Chupik, a migration lawyer in Moscow, believes the Cup is just an excuse to step up harassment. “Police like bribes, and racism in Russia is socially acceptable, so policemen grab migrants, and everybody thinks that it is normal. The changes to the registration act are making it more difficult for migrants to properly register. The increase in spot checks means that more people are being forced out of the city to ‘clean it up’ for World Cup visitors,” she told Eurasianet. Despite the spike in foot traffic, some local businesses were not thrilled, either. “There is massive congestion and all of the roads in the entire vicinity between Prospect Mira, the mosque, and Dostoevsky Metro are closed the whole day. On top of that, there are thousands of migrants who clog the sidewalks and metro entrance,” said the owner of a cafe close to the station. Hundreds of policemen maintained heavy security in the neighborhood, constructing an extended perimeter with steel barricades to control access. One officer told Eurasianet that he and his colleagues feel added pressure this year with the large number of worshippers visiting on top of the start of the World Cup, which runs in 11 Russian cities through July 15. “This celebration with tens of thousands of people makes for even more stress and work for us during an already extremely busy period,” he said.